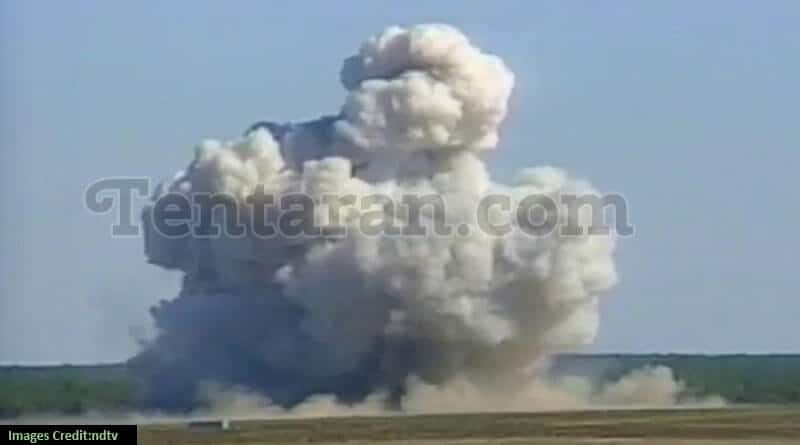 Popularly known as “Mother of All Bombs” MOAB – Massive Ordnance Air Blast, has been used for the first time ever by The United States of America in Afghanistan. The bomb is said to weigh approx. 22,000 pounds. US Air Force spokesman Colonel Pat Ryder told the media that “The GBU-43/B is the largest non-nuclear bomb ever deployed in the combat”. MOAB was designed during the Iraq War but was never used till date due to its massive destruction power, although a smaller version of the Bomb, known as “Daisy Cutter” was used by US in an earlier instance of bombing in Afghanistan. The bomb was more than 30 ft. long and too big to fit in any standard weapons bay. It had to be loaded into the cargo compartment of MC-130 Combat Talon, which is a specialized transport and was released over Afghanistan targeted area just like supplies or paratroopers are air-dropped. The news of bombing was confirmed by the White House Press Secretary, Mr.Sean Spicer at a News conference held on 13th April. He confirmed that it was “a large, powerful and accurately delivered weapon.” When asked whether there are any chances of US using the same weapon again in Afghanistan or any other country, Sean Spicer refused to comment. “The explosion was the biggest I have ever seen. Towering flames engulfed the area,” Esmail Shinwari, District Governer, Achin told AFP. The bomb said to have cost $16 million, was dropped in the Achin District which falls in Nangarhar province lying close to the Pakistani border. The main purpose of dropping this massive Bomb was to counter efforts of ISIS who have been using bunkers and tunnels for their defense mechanism and use them for their hide-out. The mission has been called “Very, very successful”by the US President Donald Trump. Donald Trump also said he didn’t know if the use of the weapon sent a message to North Korea, and that it “didn’t make any difference” if it did or not. The defense ministry also announced that as a result of the bombing, 36 IS fighters were killed and their key hideouts and deep tunnel complexes were destroyed. Precautions were duly taken by the Afghan Government to avoid civil casualties.